The hoarder home owners of the Stealers Wheel Colony have become unpredictable and the indoor TNR part of this project will have to wait until after the holidays. This project is much more than I can handle on my own. They are not just hoarders. There are many, many other problems in this house. The landlord lives in the building and walked away when I asked her if she wanted to help. None of the doors have locks on them. Different people come and go without introduction while we are there. I have my suspicions on the causes of these problems, but all I can do is try to help the animals. My animal rescue neighbor who originally found this house took four of the cats to be TNR’ed. When she brought them back, the hoarder owners refused to take back one of the cats, and made her take another one that they randomly chose. These two cats are now in her spare room and need placement in a shelter or foster home as she is fostering other animals and did not expect this. 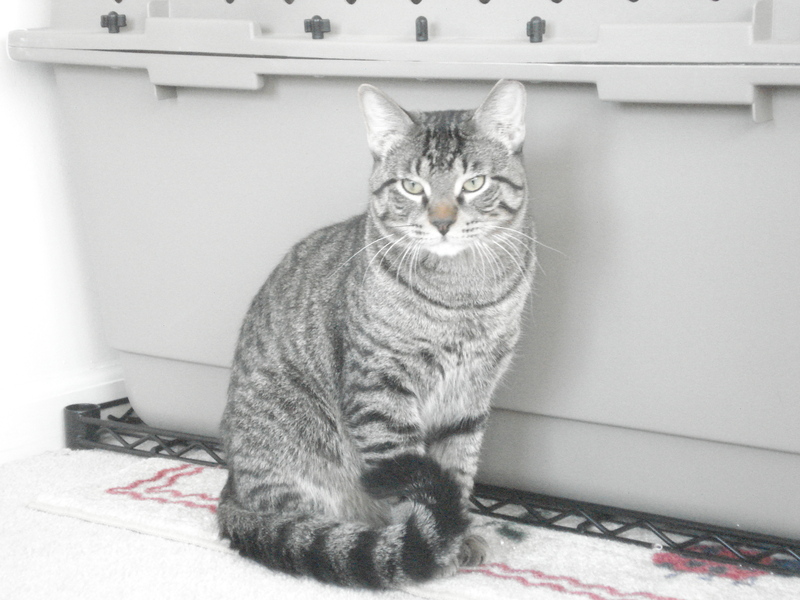 They are both male tabby cats, fully vetted, tested negative for FIV-/FeLV-, litter-trained, and dog-friendly. Gigio poses with a tail curl. 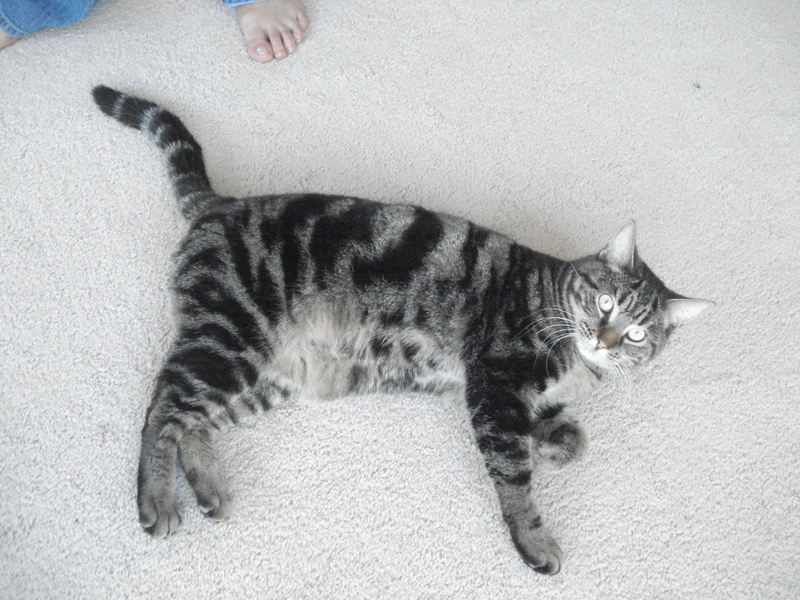 Marble relaxes and shows off his marble tabby stripes. Marble and Gigio are friends. These two are checking out their new cat toys. In fact, these two are friends with everyone. Sugar the Shih Tzu loves the tabbies, and the tabbies love him right back. 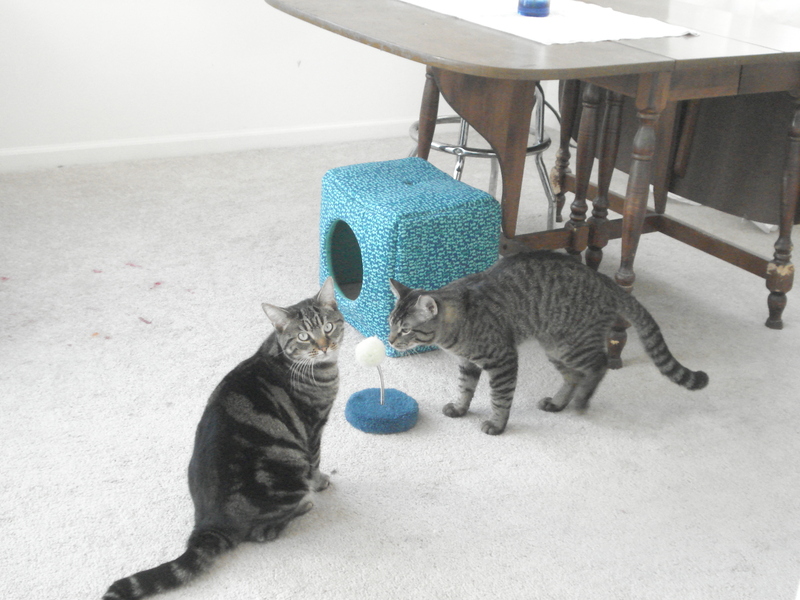 Gigio and Marble come from chaos so nothing seems to faze them – they are having a great time in their foster home and want to meet and play with every human and furry friend that visits them. If you know of anyone who is looking to adopt or foster any of the cats or know of any other ways to help, please let me know. The West Bucktown Hood Assoc. just posted a little story about this awful situation. I’m just wondering why ACS is getting involved? I’m going to guess that someone has complained or reported the situation, but if the cats are all healthy, would ACS really put them down? Hell, contact PAWS. The other day, I saw on the news that some old man left behind $1.3 million to PAWS and 3 other area no-kill shelters. PAWS was the only shelter in Chicago proper. I posted a plea to my friends on FB, in an attempt to help you…but most ppl I know will likely turn a blind eye. Best of luck, you are doing a good thing. Hi Pam, thanks for the kind words! My original plan was to trap-neuter-return all of the cats back into the house and we have done 9 so far, 2 of which are being fostered by another neighbor. I have contacted PAWS and every other foster organization and no-kill shelter that I know about to foster and/or admit these cats into their program as the owners do not want the cats and this is too many cats for me to handle on my own. The owners have also become unpredictable so I am not currently able to continue this indoor TNR project as planned. Anti-Cruelty Society’s humane investigators and Animal Care and Control Officers have been inside this home and they also agree that the cats appear to be healthy and adoptable, so I’m hoping that will happen with their help. If you know of any organizations that can help foster or admit these cats, please feel free to contact them and I can forward you the information about this house.